Franken Fran had a chapter dedicated to the idea of external fetuses. It did not end well for those babies-to-be at all. Well a recurring theme in FrankenFran is pushing for the most horrific and/or darkly comical result of any particular medical procedure (whether possible or impossible), whereas this is just how the species naturally has their children. Also, that particular episode focused on another recurring theme: human carelessness acting as a catalyst for even worse events than they would otherwise suffer. Despite the four year old getting his hands on the “power tool” last strip, it’s clear that the De’Madieas are caring and careful parents. Even in FrankenFran sometimes good things happen, but only to the rare folks who genuinely don’t deserve any cruel consequences (spoilers? not really). It’s clear that the De’Madieas are the kinds of characters the gods of Evil Ironic Comeuppance would smile and wink and give a rare free pass. At least, from what we know so far. Did you know that marsupials give birth while they are still essentially a fetus. Granted, they develop the rest of the way without leaving the mother’s pouch, but it’s still a working, real world case of external fetuses. So are some species of shark. Which is I suspect the inspiration in this case. that’s not a fetus that’s a egg different thing. . .
so why does Selkies species have breasts? are they like Monotreme and are Mammals that lay eggs? the hair seems to say that. I request Sekies species place on the tree of life unto the at least Phylum, do they have a Latin scientific name? Looks like they’re oviparous or at least the young are born VERY small. Why the kludgy human-style wide hips? To allow the laying of a bowling-ball sized egg. Well, you know, for a lifeform that lays eggs in water, there is another option. Amphibian eggs swell up after they leave the female’s body. The living part of an egg starts out as a single cell so it doesn’t take up any room at all, the bulk of a laid egg is stored food for the cell to grow, and that can be produced during the egg making process as a dehydrated layer, this makes laying the eggs easier. Once in the water this dehydrated food stuff rehydrates and the egg gets bigger. Hmm… underwater version of a stork… swordfish? Or maybe a pelican drops it from above? Definitely the retail plan, then. Pohl? I love your wife. And, holy crap, someone that knows Franken Fran. Mm-hm! I’m likin’ this gal! During college, my creative writing teacher kept emphasizing the importance of “showing, not telling”. I can tell that you ascribe to a similar philosophy; In just one page, you’ve said more about this family than ten pages of exposition could have described. I can’t wait to see more of these guys! As a side note, I’m a bit surprised that a magic-wielding alien woman from parts unknown is not only familiar with western stereotypes, but is also able to play them off pretty damn well. Well, that makes buying a crib easy! No it doesn’t! At least cribs fit in cars… imagine getting a giant fishtank! Female names seem to all be two single-syllable words (note Pohl’s initial assumption that our heroine was “Sel Kie”). And evidently neither syllable represents a family name, nor is it matronymic — though patronymic is still barely possible, I guess. Perhaps when Sister hatches, we’ll see whether her name turns out to be “Tad Pohl”. Tad Pohl…. I SEE WHAT YOU DID THERE. Or like alligators and a few other species, outside temperature and other factors that can be controlled determine the gender of the impending spawn. It could also be that girls take their mother’s family name and boys take their father’s family name. Or that “family” names have to do with when or where a child is born, or their status within a clan, or… lots of things. It’s interesting to think about! Welllll they could maybe have used an ultrasound, what with the husband being a doctor and all… Or just hoping it’s a girl. That’s inaccurate. Pohl specifically was confused by Selkie calling herself Selkie. 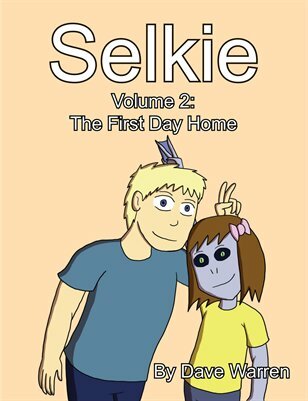 “Oh, you think that’s your NAME?” Sel Kie is merely a Sarnothi pronounciation of Selkie. Pohl does note that it’s mispronounced though. However, he tells Todd that it is mispronounced BEFORE he realized that it was Nei Li’s name. Meaning it is a word in its own right, somehow. Unless he thought Todd was failing to say “Sarnothi”. This suggests primarily that Sarnothi language is trochaic, and secondarily that male names must have 2 moras, while female names have 3. However, the spelling of “Pohl” suggests that the “o” is a long vowel, which actually makes “Pohl” a trimoraic syllable, thus completely ruining the previous theory. In other words, nice try at pattern finding, but we really have nothing. We can reasonably state that Sarnothi language is trochaic, but our current name data doesn’t really suggest any patterns. Because those are probably separate words. However, we’re not too clear on that. Even in English, there are words like “pancake”, which are sort of one word, but sort of two words, but sort of one word. There are also things like our verb infinitives “to go” which are two words but really one. Defining a word is actually really hard to do. Even if we stick to phonological “word breaks” we don’t know if Dave is actually trying to denote a word break there or is just using an orthography trick to help clarify how it sounds. Or more likely, he is COMPLETELY oblivious of all these linguistic details and just wrote something that sounds cool. On the subject of matronymic vs patronymic, we have no data there either. We only know “one” of their names. “Nei Li” and “Sai Fen” are simply their personal names. In American culture, we would call this their “first” name, just like “Sue-Ellen” or “Mary-Kate” is a single “first” name. Pohl could be a personal name, or a secondary name. In human culture I would call that a family name or a “middle” name, but Sarnothi culture doesn’t necesarily play by those rules. It could be the equivalent of a location marker like the “de Arc” from “Joan de Arc”. It’s not about biological heritage, but rather the place you were born. Pohl is likely the equivalent of his surname, because he was called “Dr. Pohl” and human custom puts a surname there. But you can also use a doctor’s first name, so again we have no solid evidence or proof. But we already know his surname is De’Madeia. “Pohl” is definitely his given name, and so “Dr Pohl” is a hybrid form combining friendly and professional. And yes, they could have a matroynmic or patronymic term in addition to the names we’ve seen, but I was speculating on whether either of the two syllables we’ve seen for females is such a name. We know both syllables of Selkie’s true name, and her mother’s, and there’s no match there, so I concluded that neither syllable is matronymic. I don’t think we have any known father-daughter pairs to test the patronym hypothesis, until Sister hatches and is given a name. Ah sorry, I missed the “De’Madeia” part. On the other hand, that form, especially the “de”, suggests this name is a borrowing from human languages, specifically one of the Romance languages. This would ultimately suggest that they have already mapped their names into the western human format of “personal family” naming, and we have almost no insight as to what their native language scheme was. It may be indicative that they did not carry surnames, but it might not. I was looking at the creator script thinking, what infant…? I’m so loving Sai Fen. This page. Just … all of it. Panel 7: Alas. There goes my pet theory that Mrs. De’Medeia was Fing Mar. I suppose it’s natural and comfortable to presume science gives us a complete understanding of the world we live in; that we more-or-less know everything already, and the only progress we can make is new and smaller iPhones. That kind of thinking is the opposite of real science, of course. Might need to define an entirely new phylum and scientific family for them… you know… like we did for each one of the currently known phylums and families, and such at one point. The background makes it that much better. … and *now* I recall Todd doing this to his parents. Wonder why he didn't react so much that time. Prolly cuz dad did a particularly gross one last night. Ha! The old Road kill cafe joke, love it. I had a friend who was rather fond of the other joke, “Mack’s Morgue, you stab em we slab em”. I think I remember Todd doing that one or a similar joke a while back. The scary thing is with a noticeable Sarnothi minority there might be a market for such a place. Seriously, though, what’s the big deal? As long as you cook it well enough, the disgusting tire germs should all die. From the article: The term “Roadkill Cafe” is sometimes considered a joke, with the tagline “You kill it, we grill it.” However, there are several real Roadkill Cafes in existence, none known to be associated with each other. Actually the problems with eating roadkill, nasty tire germs aside, is that 1. You can’t always be sure of the health/safety of the beast. It could have been ill (worms spring to mind) or contaminated by poisons etc. prior to being hit. This is of double concern during outbreaks of rabies and other such diseases. 2. Depending on how the critter was hit by the car certain internal organs may have ruptured leading to meat that is contaminated by a variety of icky things. Now that said, I’m not saying eating roadkill is always a bad idea. In fact, my father once accidently hit a deer. When he reported it to the police chief the chief told him “Off the record, here are the names of some guys we know are poaching who can butcher it for you. We haven’t caught them yet but I know they can dress the meat out for you.” In that instance there had been no reported local cases of disease in the herd (contained due to being on an island) and the beast had shown no unusual behavior prior to the accident. She is indeed awesome. I do indeed like her. And awww, baby egg! Love the new characters… but I am still left wondering how they know their next child will be a girl? I am unfamiliar with how well an egg will scan. Could be many ways to tell. One likely would be that you have one gender, then the opposite gender is guaranteed for your second child. Or not. Could be they simply can tell by looking while we humans stare at it dumbly and try not to think of frogs or sushi or some such… Yeah. Possibly they can adjust the temp and pH of the water in the aquarium to choose their gender. Love this whole day’s panels…..
Er… Dave? I notice looking at Dr. De’Madiea’s lab coat that you left the sketch layer on. Was that on purpose? I didn’t even notice until you brought it up, now I can’t unsee it. ROFL!! A. No that is not intentional. ADORBS! I drew a kappa family once that similarly had an egg and a cute younger sibling hugging it..
Loving this family! Very excited for how they may be involved in Selkie’s life—and whether Selkie continues being called by Selkie or her original name. We haven’t established that this is his family in comic. Will there be more clues or is the commentary the only way to establish this fact. Also, even with the commentary, why is everyone assuming she is his wife. She could be his single-parent sister. 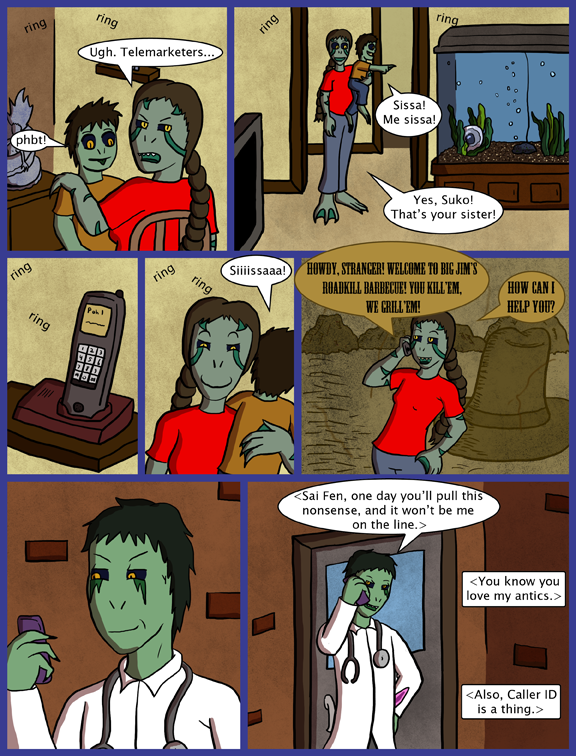 Dave already leaked that she was his wife in the transcript of the comic where Pohl calls her. Yes, it is his wife and kids. It didn’t occur to me she might read as his sister, though. It’s been confirmed in the commentaries that the subjects of the Sarnothi anatomical sketch were “Pohl and his wife”, though her name wasn’t given at the time. Dave said in the Transcript two pages ago that “Initially I was going to draw Pohl using crazy-black-and-green stuff to make a padlock-shape on his phone before dialing to suggest he was securing the line, but I think making a phone call to his wife is a lot less risky than using crazy-black-and-green stuff in, well, a PUBLIC STAIRWELL.” This led most readers to the conclusion this was his wife and kids we were seeing. I only suggested single parent as the commentary said “all four members of the De’Madiea family”. A husband would be a fifth member, and also possibly (depending on custom) change the family name of Sai Fen, Suko, and infant. So, has anyone else noticed that Pohl has removed the webbing between his fingers? I understand why, and it seems like it would be painful. Long time reader, first visit was before Selkie was even adopted, with regular archive catch ups since. I’m loving how the story is finally moving forward beyond the slice-of-life stuff. Question: Are those stripes/marks on Sai Fen and Pohl natural markings, or cultural? If it’s the former, how long before they start showing up on the star of the show? That’ll be a fun storyline for sure. Natural markings, and roughly around adolescence. Does it need to be constantly monitored for when it’s about to hatch? Or do the parents just wake up one day to find the newest addition to their family floating/swimming around on his/her own? If the outer layer is as transparent as it seems to be, they’d be able to see her moving and preparing to hatch prior to it actually happening. Heck, the kid might need help in breaking the outer layers of the egg, to, for example, prevent it from hatching unattended (kid could wander/swim off and die of elements/starvation). One thing I noticed is the inconsistency of Suko’s size. In the last comic, he seemed as big as an elementary school kid, with his torso a sizeable fraction of Sai Fen’s, and now his torso is barely longer than her sleeve and he can be carried in one arm. The latter size fits his language more, but how big is he supposed to be? Dave initially cast him as a 4 year old, but I suspect he’s downgraded his age after a number of us commented that the little guy’s behavior and speech was more typical of a child younger than 4. Just a pinch. I wrote him in a “advanced toddler-to age-2” stage but drew and discussed him as a four year old without changing the dialogue, based on feedback dialed back to the initial 2-ish years old premise. wow. its bad enough I’ve been gone and not committing on hear but I finally get the nerve to do art again. I kind of think it was bad that i knew pohl and his family had a different markings and such than seilkie. I’ll send a link to the new “sketch” I’m doing of Sai Fen.